Left: SAAY recipient Aaron Jones with Assistant Deputy Minister of Natural Resources, Beth MacNeil Right: SAAY recipient Danielle Patzer with FPAC CEO, Derek Nighbor. Photo supplied. Forest Products Association of Canada (FPAC) and the Canadian Council of Forest Ministers (CCFM) are proud to open applications for the eighth annual Skills Awards for Indigenous Youth (SAAY) program. 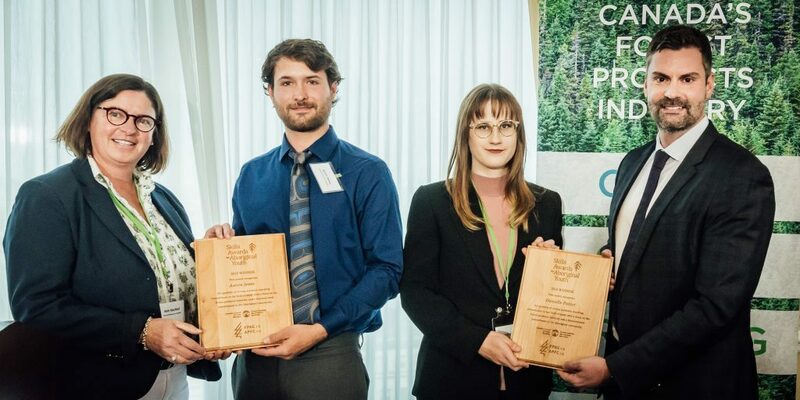 Since 2012, FPAC’s Skills Awards for Indigenous Youth has been recognizing exceptional Indigenous youth who go beyond to support their communities and contribute to the forest sector. In 2015, FPAC collaborated with CCFM to expand the program to offer two awards of $2,500. Nominations for the annual Skills Awards for Indigenous Youth are due March 31, 2019. Winners will be recognized and celebrated during FPAC’s annual award ceremony on May 9th in Vancouver.